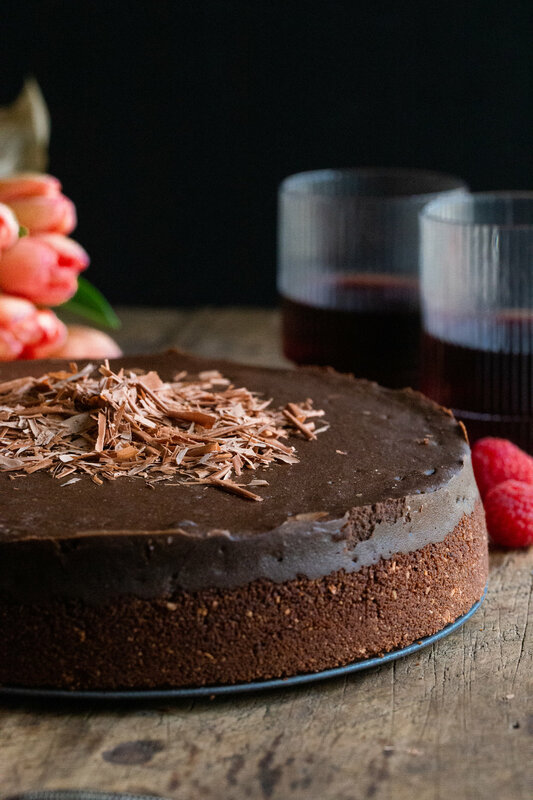 As promised, today I am giving you the ideal dessert for Valentine’s Day that is equal parts decadent and addicting: the ultimate rich and creamy chocolate cheesecake. Earlier this week, I shared my recipe for lemon poppy seed buttermilk waffles that are fresh, light and perfect for Valentine’s Day breakfast/brunch. So I wanted to go the opposite direction for dessert and give a rather sinful dish that will hit you over the head with it’s rich and chocolate-y flavor. 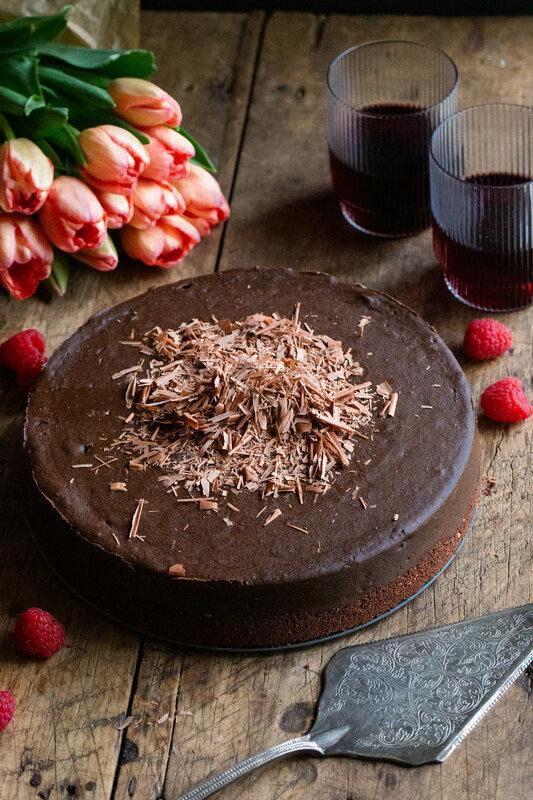 As far as desserts go, Valentine’s Day is all about chocolate and since I’m at the point where I can make cheesecakes in my sleep ever since my Pumpkin Cheesecake post, I thought it was about time to give my recipe for my favorite chocolate version. I was planning on giving this recipe back at Christmastime, because I usually serve this for our Christmas Eve dinners, but I decided to put it off and wait for the right time. A day where you show people how much you love them with extravagant gifts, flowers and desserts? Valentine’s Day is definitely the right time for this recipe. Chocolate cheesecakes are typically made with an Oreo crust and although Oreos are my favorite cookies in the entire world (I’ve put much thought into this), I didn’t want to take anything away from the cheesecake filling. Like ketchup, if there’s Oreos in any dish, that is the dominant flavor that you will be tasting, so I decided to stick with my favorite graham cracker crust but put a spin on it by adding cocoa powder. I was hesitant that the cocoa powder wouldn’t really come through against the graham crackers, but the end result was absolutely delicious and I couldn’t be happier with it. Alternately, you can make it a bit easier for yourself and buy chocolate graham crackers from the grocery store and skip the cocoa powder. 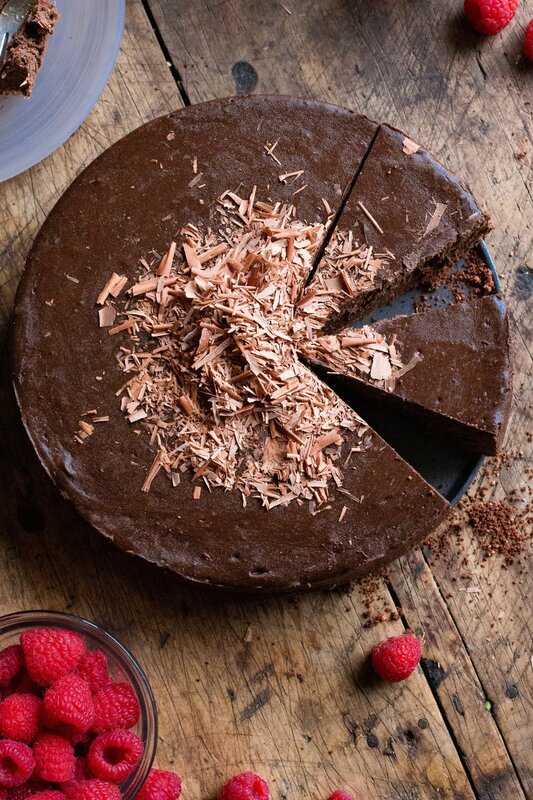 As for the filling, it’s a rather straightforward recipe for a cheesecake and the only chocolate that is added comes from two cups of chocolate chips. Because we won’t be using any other kinds of chocolate in the filling like cocoa powder or chocolate bars, I recommend opting to use a higher end brand of chocolate chips, such as Guittard or Ghirardelli. We’re making a chocolate cheesecake that has no bells or whistles and so we want the chocolate that we’re using to be high quality. And if you have chocolate bars laying around, definitely make chocolate shavings and top your cheesecake with it! It’ll add a dramatic touch to the cake and can also cover up any cracks that may occur. But we won’t have any cracks, will we?! The last time we made cheesecakes together, I gave pretty detailed directions in how to achieve a flawless looking cheesecake. To summarize: 1) all ingredients for the filling need to be at room temperature. In this recipe, this means the cream cheese and eggs, but not the milk since it will be warmed up in the microwave; 2) do not over mix the batter! Over mixing adds too much air which will cause the cheesecake to rise too quickly in the oven and therefore fall and develop cracks; 3) bake the cheesecake in a water bath - an optional but highly recommended step that not only insures a crack-free cheesecake, but leads to a cheesecake with a smooth, moist, and creamy texture; and 4) allow the cheesecake to cool properly meaning slowwwwwwwly. It’s best to leave the cheesecake in the oven for an hour after it’s done baking (with the oven turned off), and then bring it to room temperature on a cooling rack before eventually transferring it to the fridge. Let’s go back to the water bath method for a minute. If you’re having trouble visualizing exactly what it’s supposed to look like, here’s a video that should give you some clarity. And if you’re like me and worried about water getting into your springform pan despite having the foil wrapped around it, there’s the option of using slow cooker liners. You simply wrap the liner around the springform pan, tie the excess bag in a knot, and then wrap foil around it. I got this idea from the blog, Life, Love and Sugar, and if you click here, you’ll see step-by-step photos on how to do it. Ands that’s it! I know all of this information seems a bit daunting and may lead you to consider running to get a box of chocolates from Sees Candy instead. But, please don’t! Homemade is always so much more meaningful even if it comes out looking like a hot mess or tastes a bit off. Trust me on this! And if you’re single, this cheesecake will be perfect for your Galentine’s Day party for you to split with all your girlfriends, or you can make this and send your kids to school with it to share with their class. Or do like Alex and myself, and slowly chip away at it each day and cry when it’s all gone. Move the oven rack to the lower-middle position and preheat the oven to 350°F. In a bowl, mix the graham cracker crumbs, brown sugar, cocoa powder, and melted butter and transfer to a 9 or 10 in. springform pan. Using the back of a measuring cup, firmly press the crust mixture into the bottom of the pan as well as the sides. Try to get the crust as evenly spread as possible. If the sides aren’t perfect, no worries. Bake in the oven for 10 minutes. Remove from oven and let cool while preparing the filling. Keep the oven on at 350°F. In a microwave-safe bowl, melt the chocolate chips and milk together until smooth. Do this in 30 second intervals, stirring well after each time, and being careful not to burn the chocolate. Once melted, stir in the espresso powder (if using) and set aside. In the bowl of a stand mixer fitted with the paddle attachment (or in a large bowl if using a hand mixer) beat the cream cheese on medium speed for 2 minutes, and then add in the sugar and cream together until no lumps remain. Scrape down the sides of the bowl. Add the eggs one at a time on low speed, making sure each one is incorporated into the mixture before adding the next. Add the vanilla extract and flour. Scrape the sides of the bowl again. With the mixer on low, slowly add the melted chocolate and milk mixture to the bowl. Once all is added, turn off the mixer and finish mixing the filling using a spatula, making sure to get anything that may be down at the bottom of the bowl (this area usually gets left untouched when using a mixer). Pour the cheesecake filling into the pan and spread it evenly. Boil a full kettle of water for the water bath. While the water is heating up, carefully place the springform pan in the slow cooker liner (this is an optional step, but if partaking, I provided a link above that has a visual for this), and then finally, tightly wrap the pan in 1-2 pieces of foil. Place the wrapped springform pan inside of a roasting pan. Once the water is boiled, you can either 1) pour in the water while the roasting pan is in the oven or 2) pour in the water with the roasting pan out of the oven. Either works, just try not to have the oven door open for too long if you choose option 1. Bake the cheesecake for 55-70 minutes. The center of the cheesecake will still have a wiggle to it, but the outer edges will be set. Turn off the oven, crack the door slightly, and leave the cheesecake in there for one hour. Remove the cheesecake from the oven and allow it to cool completely on a cooling rack before transferring it to the refrigerator. Chill the cheesecake for at least 4 hours before eating it. When ready to serve, run a knife around the edge of the pan and remove the springform pan piece. Top with shaved chocolate, raspberries, homemade whipped cream, etc. Cheesecake will last up to 5 days in the refrigerator - just cover it with plastic wrap. It feels kind of insane to sit here and give you a cheesecake recipe with everything that is going on in my home state of California. With a mass shooting and 3 deadly fires that are far from being contained, California has been through a lot this week. I grew up in Oak Park and Agoura Hills (where the Woolsey fire is wreaking havoc) and my grandma and dad both still live in the area. Although my family members are okay, I’ve been sick to my stomach thinking about those who were less fortunate and what they had to endure this past week. It’s devastating to think how many people will not have a home to celebrate Thanksgiving and other holidays this year. When natural disasters happen like this, I feel absolutely powerless to make the situation better; I wish I could put an end to the pain that they’ve all suffered. If you’re wanting to help out in any way, there is always the option to donate to organizations that will support those who lost their homes, businesses, etc. and of course aid those who are risking their lives to end these fires. The New York Times has a great article that outlines how you can help out; it should lead you in the right direction. And please just be thankful for what you have every.single.day and not just on Thanksgiving. With Thanksgiving right around the corner, the upcoming recipes I’ll be giving you will not only be perfect for the big day, but also for the rest of the holiday season. These desserts are actually what I plan on making for either the Friendsgiving party I’ll be attending this weekend, or for Thanksgiving itself next week. So since I’m making these myself, I can promise you that they are all tried-and-true recipes that I firmly stand behind and have made countless times. Growing up, cheesecake was never really my thing. I liked it just fine, but always felt like it was too rich and I could never eat more than one or two bites. My sister on the other hand could probably polish off an entire cake to herself if she was in the right mood. Her cheesecake obsession is what led me to making pumpkin cheesecake for Thanksgiving about 3 or 4 years ago when she texted me asking (aka demanding) that I make it. I obliged and in the end, I was left with an incredible dessert that not only made my sister happy, but led me to finally become a huge cheesecake fan. The thing with cheesecakes is that they can be a bit intimidating to make due to the time and patience that goes into baking each one, especially if you don’t want to end up with the dreaded cheesecake cracks. Below are my tips for cheesecake success. The ingredients - cream cheese, sour cream, eggs - all need to be at room temperature, which I suggest pulling out of the fridge 4-5 hours before you plan on baking. When making the batter, more attention is needed in order not to over mix it. This is a given for most recipes like cakes and cookies, but especially important with cheesecakes because if you over mix and add too much air, the cheesecake will rise too quickly in the oven and then fall… and crack. Not good! A water bath needs to be prepared - this is optional, but I strongly recommend it. The first time I made cheesecake with a water bath was also the first time I didn’t have a crack in my cheesecake. That alone was enough for me to convert to this method, but it offers much more than making your cheesecake more attractive. A water bath ensures even baking and gives the cheesecake the creamiest, most amazing texture. Essentially, the cheesecake is enjoying a day at the spa and comes out of the oven smooth and moist. And lastly, the baked cheesecake needs to cool properly, which in this case means gradually. This entails having the cheesecake sit in the oven with the door cracked and the heat turned off for one hour, then sitting at room temperature until completely cooled, and then finally, refrigerated for at least 4 hours before even cutting into it. Pretty much, if someone shows up to Thanksgiving or any party for that matter, with a homemade cheesecake, please give them a big hug and say “thank you”. The good news is that cheesecakes can be made days in advance (4-5 days) and can be left, covered, in the refrigerator. This is why it’s perfect for Thanksgiving, because you can check off dessert days before worrying about the turkey or sides. I know this all sounds stressful, and believe me, I get it, but if you follow the tips and steps I provided, baking a cheesecake isn’t all that bad. And if you do get a massive crack in your cheesecake, just cover the dang thing with a ton of whipped cream and no one will care, I promise. P.S. If you also want to decorate your cheesecake with sugared cranberries like I did, simply dip the cranberries in egg whites (pasteurized if you’re nervous about raw egg) and then gently roll them in granulated sugar. 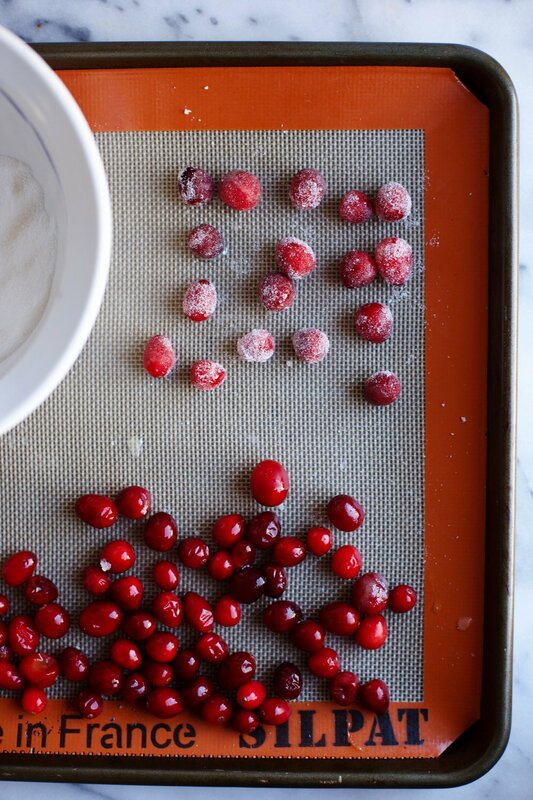 Try to get one even coating of sugar so that you can still see the color of the cranberries. It’s easiest to do one at a time. Move the oven rack to the lower-middle position and preheat the oven to 350°F. Grease the bottom of a 9” or 10” springform pan and line with parchment paper. In a bowl, mix the graham cracker crumbs, brown sugar, cinnamon, and melted butter and transfer to the pan. Using the back of a measuring cup, firmly press the crust mixture into the bottom of the pan as well as the sides. Try to get the crust as evenly spread as possible. If the sides aren’t perfect, no worries. Bake in the oven for 9-10 minutes. Remove from oven and let cool while preparing the filling. Add the pumpkin puree, sour cream, vanilla extract, cinnamon, pumpkin pie spice, and flour. Slowly mix together on low, and begin to gradually add the eggs, one at a time. Once the eggs are incorporated, turn the stand mixer/hand mixer off. Finish mixing the filling using a spatula, making sure to get anything that may be down at the bottom of the bowl (this area usually gets left untouched when using a mixer). Pour the cheesecake filling into the pan and spread it evenly. Remove the cheesecake from the oven and allow it to cool completely on a cooling rack before transferring it to the refrigerator. Chill the cheesecake for at least 4 hours before eating it. When ready to serve, run a knife around the edge of the pan and remove the springform pan piece. Serve with whipped cream, ice cream, or a drizzle of caramel. Cheesecake will last up to 5 days in the refrigerator - just cover it with plastic wrap.